Sunny Ramsgate - another example of the efforts of the South Eastern & Chatham Railway and its French partner the Chemin de Fer du Nord to encourage our friends across the water to visit the South's great seaside resorts (see also Herne Bay 1906). 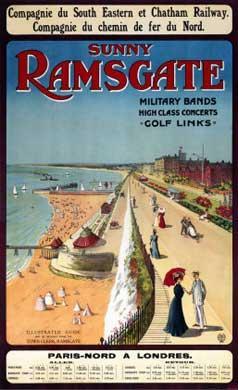 Other than the sun, Ramsgate's attractions included military bands, high class concerts and golf links. Apparently. The poster promotes Chemin de Fer du Nord's route from Paris Gare du Nord. The SE&CR was formed in 1899 so from that and the women's dress I would date this as Edwardian (1901 to 1910). I only have this low-resolution image so I am unable to confirm any other information. If you can, especially the artist, please let me know. I would love to know just how much traffic these posters created. I don't recall stories of Edwardian Kent resorts overrun with French tourists.